We are getting ready to kick off day two of the WEROC Australia finals. Yesterday proved to be a day full of carnage for many. There were broken axles, transmissions, and more. Rigs were on their lids, and stuck in holes. When the dust settled, it wasn't only an American sitting at the top, but it was a American female. Becca Webster is sitting in first place after day one with 29 points. 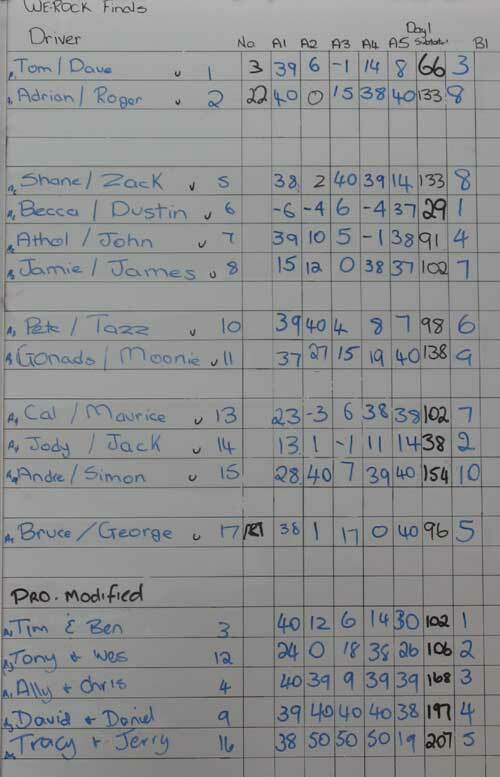 Trailing behind Becca is Jody Everding at 38 points, and sitting in third place is the Aussies Tom and Roger at 66 points.. The Australians are trailing behind the Americans, but they are far from out of it. There are plenty of bonus lines available to play catch up. I wish the Aussies luck! We should be getting started in about an hour, so stay tuned! Can Team USA overcome their horrible start on day 2? 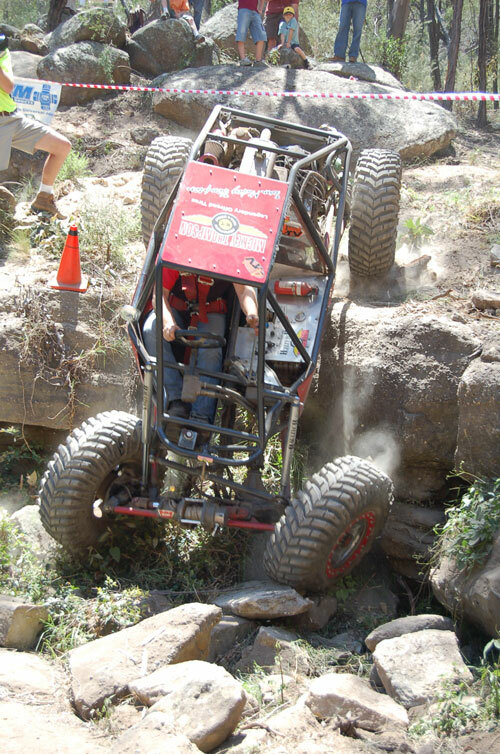 Bruce Zellar had a great start on his first obstacle only to time out 3 feet from the finish line. The Aussies are off to a huge start, and the top 3 Americans have all 40'd their first obstacle(s)! Bruce Zellar was off to a great start mastering his first course when he got within 3 feet of the finish gate and got high centered and timed out. Becca Webster who was our leader coming into today, timed out attempting a bonus line on course #4. 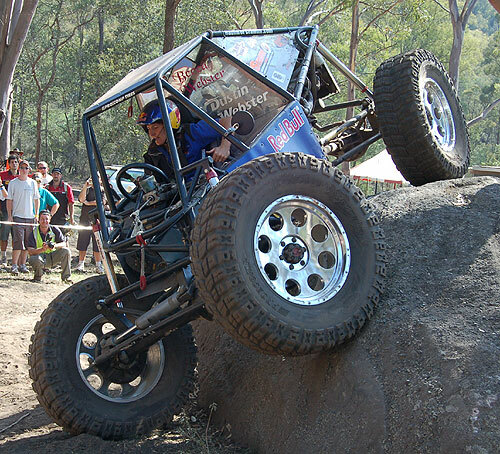 Jody Everding battled with his first obstacle in true wild man style but also ran short on time and received a 40. 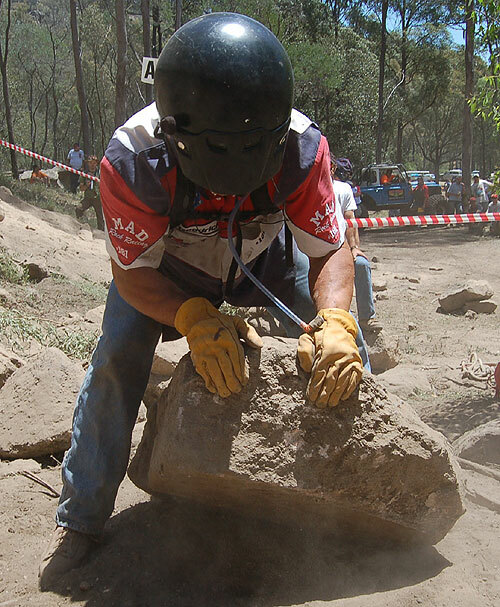 The Australians are off to a huge start spanking their first obstacles. With Becca and Jody both getting 40's, this puts Tom the Australian into 1st place. I just watched both Tom and Adrian make short work of their first obstacles, and both are looking great. What an exciting turn of events! 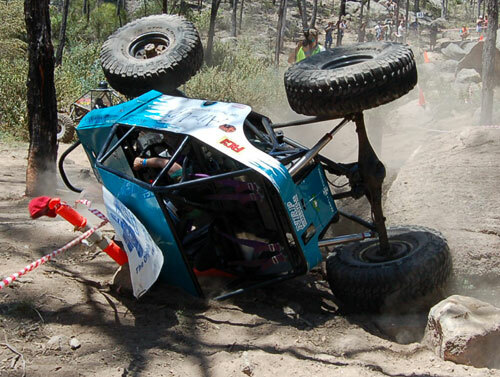 Tony Robinson had a great start making his first course of the day look easy - even with a broken front axle! Bruce Zellar and George seem to be back on track, and score a -2 on their second course of the day. Dustin and Becca are back on their game as well with a negative score on their second course. 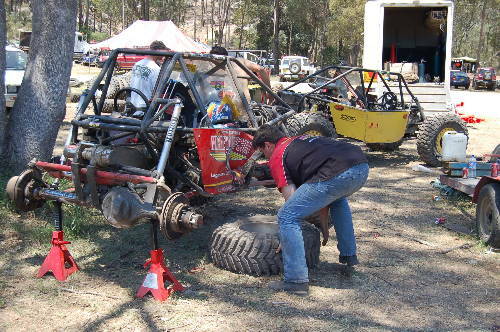 Jody Everding's pit crew is working frantically to get the rig fixed. 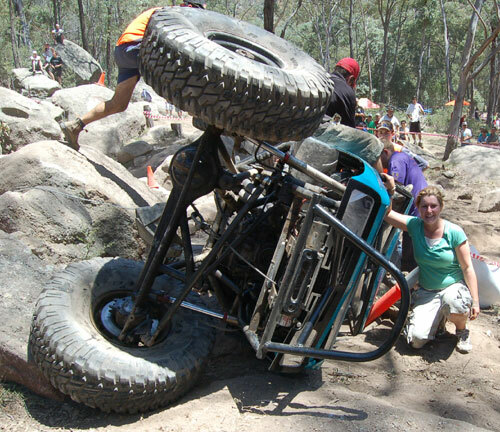 Apparently they taco'd a link and toasted a power steering pump on their 1st obstacle. Jody's wife told me "Our pit crew here is absolutely amazing! I wish we could bring them all home with us and use them at competitions at home!" Hopefully they can get it fixed in time for their next obstacle. 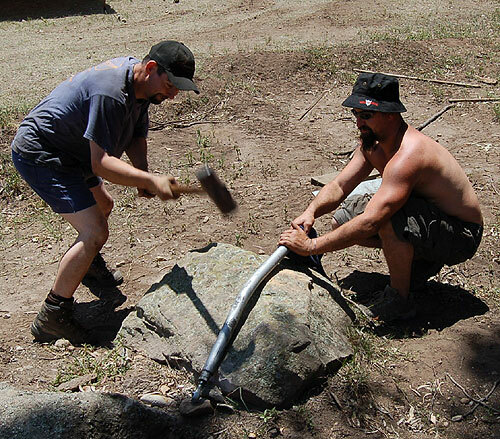 Jody Everding has an army of Aussies as a pit crew. These two guys are trying to straighten one of Jody's bent links. There's only one. 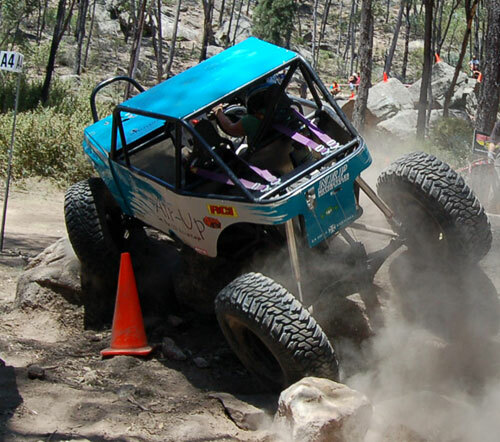 No, literally, there's only one Jeep at this competition. 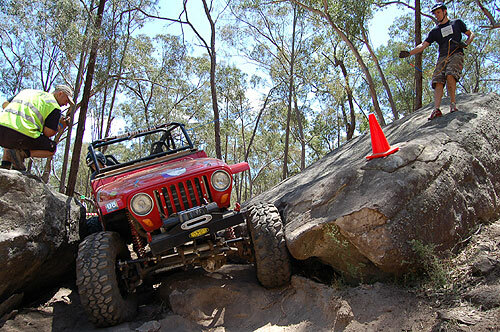 Shane spanked his last course in his Jeep TJ. 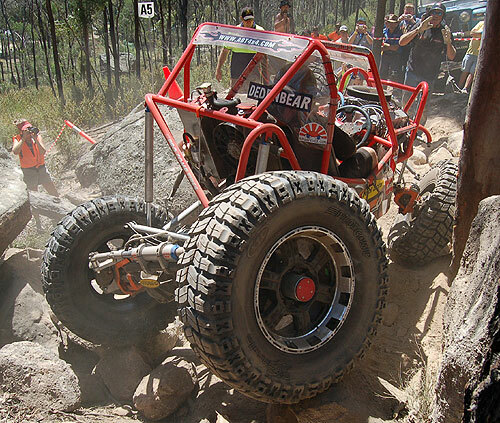 It's got all the goodies any Yank would love to have - Dana 60s, Atlas II, etc. Shane drives his rig in the Super Modified class instead of the Pro Modified class. He was sitting in 8th place coming into today. Shane isn't afraid to get it in his TJ. Adrian made this bonus line look easy, but then couldn't get back up the dirt hill. 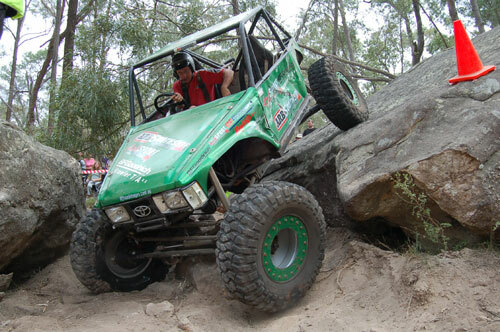 Trying to hammer down up the hill, he broke something in his Toyota front end, which cost him 40 points. The plot thickens! Tom broke a rear ring and pinion at the same spot that Adrian broke a front ring and pinion. It cost him 40 points, so that puts Becca, Jody, and BZ back in the game. 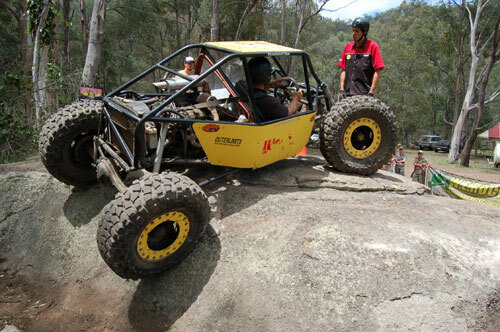 The Aussies both race to change ring and pinions in both of their moon buggies. Becca and Dustin are still doing great, and are back in the lead. Dustin just stopped by Pirate headquarters (the Nissan Patrol TD rental adn the Rhino Toyota) to tell us they are on breakdown time. They have a severely leaking radiator that needs to be replaced. They are working on getting a replacement. It should be ready for their last obstacle. Jody is back in the game after hammering a link and roasting a power steering pump. Jody finally got his rig fixed, with only minutes of breakdown time to spare. I just watched him complete his second obstacle of the day. He hit one cone and had a couple of backups, but most everyone did the same thing on that obstacle. He's definitely back in the hunt, and will be nipping at Becca's heels the rest of the day. 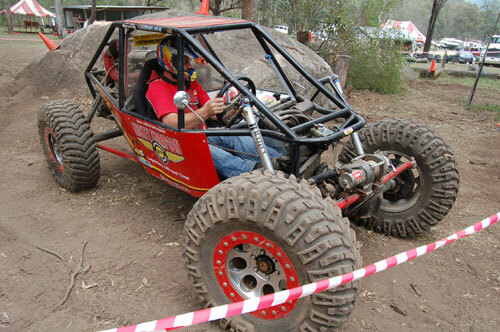 I don't know how much power it has, but Jody is loving the rumbling V8 under the hood of his Aussie built buggy. Even with the cannons for arms George has, BZ still couldn't get up A3. Bruce Zellar was denied on obstacle A3. 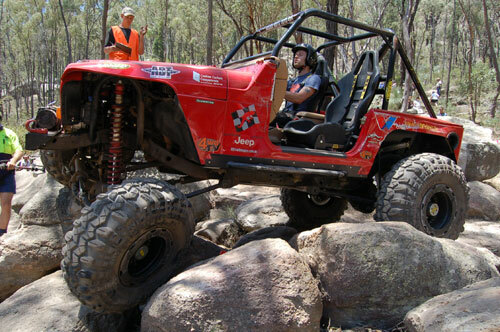 Despite epic rock stacking by his spotter George, he couldn't manage to claw his way to the top of the loose dirt climb. Ally had a spectacular finish on obstacle A4. Her spotter Chris told her to hammer it through the finish gate, and that she did, right onto her side. She finished the course in style! Now that's gettin 'r done, Ally!. Well is WAS a perfectly clean Jeep this morning!. USA WINS FIRST AND SECOND! Becca Webster drives to perfection in a dramatic finish! 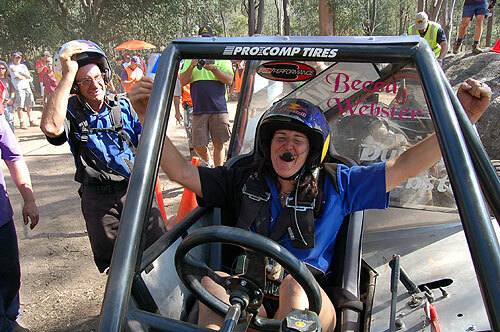 Becca ruled Australia, no doubt about it! 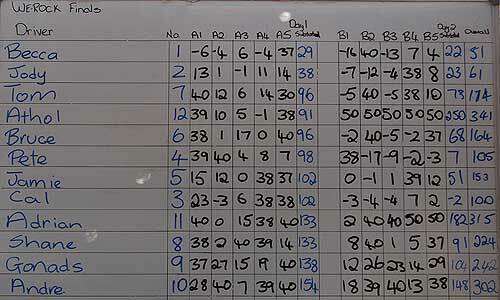 Here are the final official scores. Jody Everding gave it all he had on his last run, with a two point lead over Becca Webster. Unfortunately there was a little controversy over a judge's cone call, so Lil Rich was called over to rule on the call. The rule book was brought out, and the judge's call stood - 10 point cone penalty. This call would allow Becca to take home the title providing she finished her final obstacle without hitting a cone, and successfully making the bonus climb. Becca drove flawlessly, only taking one planned backup on the entire course. This is Becca's second win in a row, as she just won the women's national championship last weekend. Way to go, Team Red Bull! There was a little controversy over a cone on Jody's final run of the day. Lil Rich Klein was called over to make sure the rules were being adhered to properly. 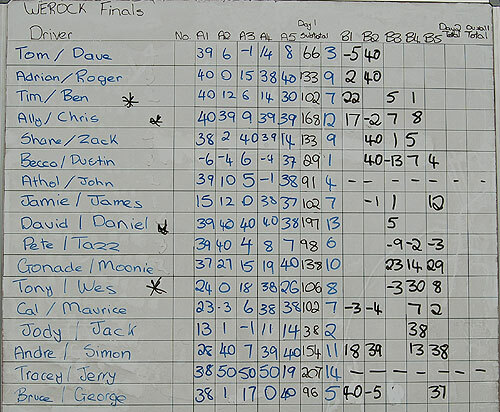 This about wraps up our coverage of the 2005 WEROC Australian finals. The event was absolutely great, the people here in Australia have been great, and the overall experience of coming down here will never be forgotten. I really appreciate the hospitality of everyone involved. 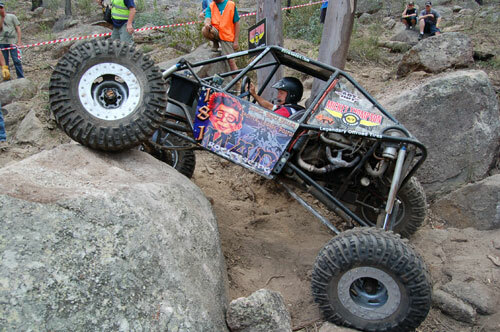 I especially want to thank Sam Overton from Haultech Engineering for providing the US competitors with vehicles. Check out Haultech.com here. Once again I have hundreds of great photos to upload. I will be uploading these as soon as I can find a reliable Internet connection. Most likely when I get home on Wednesday.